We can identify and supply the most suitable plants and products needed to make the most of your garden whether you are a gardening novice, enthusiast or even a professional landscape gardener! No matter the size, aspect or theme of your garden, be it big or small, rooftop or water based, we have it all. Our experienced qualified and knowledgeable staff can offer suggestions on how to make the most of your available space. Take note of where the sun shines during the day, as some plants like to be in the shade in the morning, others need sun all day if they can get it. Does water lie in some areas for a few days after heavy rain. It is adviseable to bring photos or a site plan with you when you are coming. 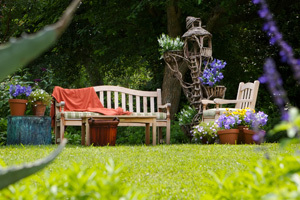 Create an outdoor living area you'll treasure with Beechdale Garden Centre. Contact Us Today to make an appointment to meet one of our qualified staff who will guide you through the options suitable to your needs and requirements.